One of last partially intact ahupuaa on O`ahu, Waimea Valley consists of 1,875 acres and has been a sacred place for more than 700 years of Native Hawaiian history. Waimea, “The Valley of the Priests,” gained its title around 1090 when the ruler of Oahu awarded the land to the kähuna nui. Descendants of the high priests lived and cared for much of the Valley until 1886. 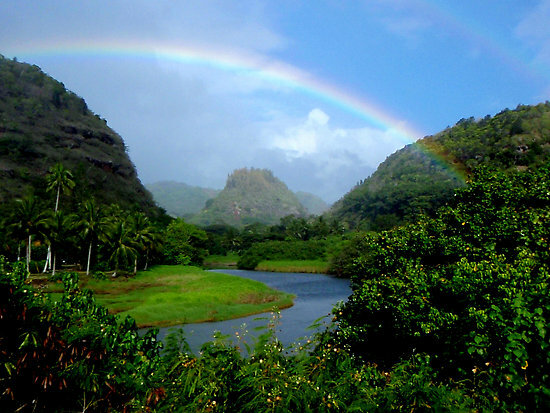 As part of a cooperative conservation land purchase, the Office of Hawaiian Affairs acquired the property in 2006. 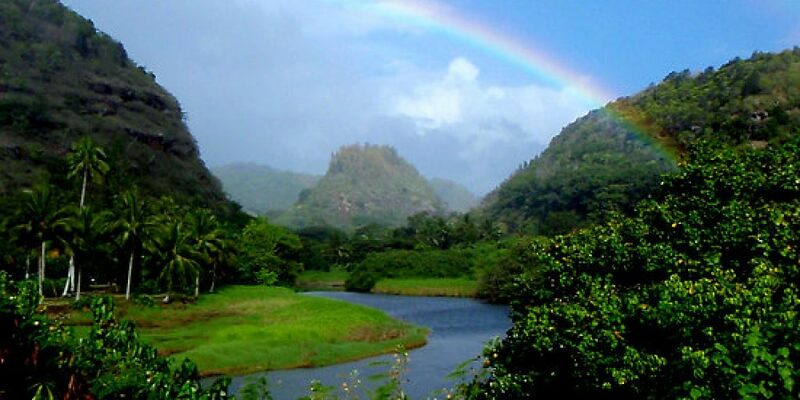 In 2008, Hiipaka LLC was established to manage Waimea Valley and hold the deed. Take a casual walk on a paved path through our World Class Botainical Gardens and Historical Sites 3/4 of a mile one way or 1 1/2 miles round trip from our Ticket Booth (where you pay Admission into the Valley) to our Waterfall area. Several activities (with paid admission) are offered throughout the day in different locations in the Valley. Ancient Hawaiian Archaeological Sites: 78 sites of interest have been identified including religious sites and shrines, house sites, agricultural terraces and fishponds. The 150-acre Botanical Collection contains more than 5,000 kinds of tropical and subtropical plants including native and endangered Hawaiian plants. Several native and endangered birds including the alae ula are found in Waimea. All five species of o’opu, a native freshwater fish can be found in Kamananui Stream. Because Waimea Valley is home to so many endangered plants and animals, we do not allow any domestic animals to be brought in. This includes birds, cats and dogs, with the exception of service animals.. Visitors to the Valley are invited to participate in several free activities (with paid admission) including Hula Implement demonstrations, Hawaiian Games, and Crafts, Music & Story Telling with Kūpuna. An attraction of great interest and enjoyment is the Valley’s 45-foot waterfall. Waihï is approximately 3/4 of a mile from the Ticket booth. Kuono Waiwai, the Valley’s retail store, showcases the work of North Shore artists and Hawaii crafters of locally made products. The Valley’s on-site concession services uses locally grown, made-in-Hawai‘i ingredients for local dining at its best.